It was 50 years ago today when President John Fitzgerald Kennedy was assassinated in Dallas. Fairview Elementary School in Milwaukee, WI. On November 22, 1963, I was in the second grade at Fairview Elementary School in Milwaukee. On that afternoon we were at lunch and then the after lunch recess time when we could run about on the playground before returning to class. None of us were aware of what was happening in Dallas; we were seven years old. When we did return to our classroom, the teacher, Miss Kowski (Don’t remember if that’s the correct spelling), was quietly sobbing. She stood in the corner and would furtively glance at us as she cried. We were all quiet, including the class clowns. Something was terribly wrong. Finally she turned around, still crying and told us the president had been killed and we should all go home. As I recall we all started walking out the door. The principle, Mr. Morrissey, stopped some of us and asked what we were doing. Someone told him what had just transpired and he let us go. I spent the rest of the day and night watching the news with my parents, both of whom were devastated by the news. The official portrait of our 35th President, John F. Kennedy. My parents, good Catholic Democrats, had both worked on the 1960 Kennedy for President campaign so this was especially terrible news for them. It was the Kennedy assassination that woke me up to politics, at such a young age. JFK was a hero in our house and we were very proud, as a family, to have contributed to his election. President Kennedy was the first president to have been born in the 20th Century. He was a new, young man with a vision for a progressive future. He was one of us. As of November 22, 1963, President John Fitzgerald Kennedy became a martyr and a saint, at least in the Forkes home. In the 50 years since, we’ve learned a lot about our 35th president. He was a womanizer, even bedding the beauty of the day, Marilyn Monroe. Her birthday present to him, singing “Happy Birthday” on President Kennedy’s 45th birthday, May 19th, 1962 — ten days early. He had to be pushed to help the civil rights demonstrators in the South, when police and sheriff departments were turning dogs and water hoses on the peaceful marchers. President Kennedy had serious health issues that bothered him daily, in particular his back. He couldn’t get into the Army as a result of his back, so he joined the Navy in September 1941 instead. John F. Kennedy aboard the PT-109 in the South Pacific, 1943. Photograph in the John F. Kennedy Presidential Library and Museum, Boston. Kennedy’s actions as the commander of PT Boat 109 became the stuff of legend when, after being rammed by a Japanese warship off the Solomon Islands in November 1943, he rallied the surviving men in his command to save themselves by swimming to nearby islands to await rescue. Two islands, swimming miles to each of them, all while dragging a badly injured sailor, the lifejacket strap clenched in his teeth. President Kennedy wasn’t just the first Irish Catholic to be elected president, he was a war hero, decorated with the Navy and Marine Corps Cross. We learned that President Kennedy inherited the Bay of Pigs operation (April 17, 1961) from his predecessor, Dwight D. Eisenhower and when it went bad, Kennedy got tagged with the failure. Then the anti-Castro crowd became an anti-Kennedy crowd as well because they felt he didn’t support the men who tried to over throw Castro. We learned all of these details about the age of “Camelot,” as the Kennedy Administration had been dubbed. The original cast album from the Broadway musical Camelot was a favorite of the president so the connection was made between the two. With his tragic end, Kennedy’s memory — and that of his family — has been mythologized, although members of his family have, over the years, tried to play that down while still holding the two Kennedy Brothers, John and Robert, in high regard. Julie Andrews and Richard Burton in the Broadway musical Camelot. Robert was assassinated June 6, 1968. More details would emerge, raising larger questions with policy implications. Was Kennedy going to end U.S. involvement in Vietnam? John F. Kennedy was a cold war hawk. The only outcome he wanted with the war against the Soviet Union and to a lesser extent Communist China, was for Soviet-style communism to be defeated and those two countries, plus all their satellites, be turned into democracies, friendly to the United States. John F. Kennedy believed the “domino theory:” if Vietnam were to fall to the communists then all of Southeast Asia would follow, as would Indonesia and possibly India. Despite that, Kennedy seemed to be pulling away from a conflict in that region. U.S. advisors had been in Vietnam before the Kennedy Administration and Kennedy built up the American presence once he took office. But records about the Vietnam War were released to the public in the 1990’s and indicated Kennedy was starting to withdraw the advisors, which numbered over 17,000 at the time. President Kennedy’s assassination changed the trajectory of U.S. involvement in Vietnam, according to some historians and for others it was a reason President Kennedy was removed from office. Now we get into the conspiracy theories. Why was Kennedy murdered? Was it because of Cuba, the Bay of Pigs? Was he perceived as soft on the Soviet Union and Red China, due to his withdrawal of U.S. advisors from Vietnam? 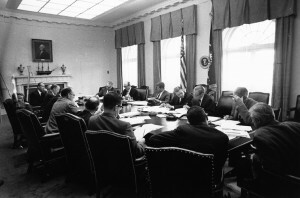 29 October 1962 Executive Committee of the National Security Council meeting. Clockwise from President Kennedy: President Kennedy; Secretary of Defense Robert S. McNamara; Deputy Secretary of Defense Roswell Gilpatric; Chairman of the Joint Chiefs of Staff Gen. Maxwell Taylor; Assistant Secretary of Defense Paul Nitze; Deputy USIA Director Donald Wilson; Special Counsel Theodore Sorensen; Special Assistant McGeorge Bundy; Secretary of the Treasury Douglas Dillon; Attorney General Robert F. Kennedy; Vice President Lyndon B. Johnson (hidden); Ambassador Llewellyn Thompson; Arms Control and Disarmament Agency Director William C. Foster; CIA Director John McCone (hidden); Under Secretary of State George Ball; Secretary of State Dean Rusk. White House, Cabinet Room. Photograph by Cecil Stoughton, White House, in the John F. Kennedy Presidential Library and Museum for the image. In October 1962 the world came as close as its ever been to all out nuclear war with the Cuban Missile Crisis. U.S. spy planes detected medium-range missile installations going up in Cuba and for nearly two weeks the U.S. and the Soviet Union danced around the outcome. Our military leaders wanted the all out confrontation. They saw the crisis as a reason to have that nuclear war and defeat communism once and for all. Kennedy disagreed and through two weeks in October, 13 days to be exact, the U.S. and the Soviet Union played out the confrontation publicly and secretly. Eventually a compromise was reached. The Soviets withdrew their nuclear weapons from Cuba, the U.S. withdrew nuclear missiles from Turkey and the world was given the term, Mutually Assured Destruction — MAD. We had the largest arsenal of nuclear weapons in the world (we still do) and some military leaders wanted to use them. To suggest they were disappointed we didn’t got to nuclear was would be an understatement. Then there were those people who said we should invade Cuba, have a ground war and oust Fidel Castro — all of these war ideas swirled around the Oval Office for 13 days and then the crisis ended with little fanfare and one downed U2 spy plane. Was this even more reason for members of the military leadership to stage a coups d’etat? It’s speculation, every last bit of it, but much of it fueled by facts in the public record. Even though the Warren Commission concluded Lee Harvey Oswald acted alone when President Kennedy was murdered, no one really believed it. Kenny O’Donnell, Special Assistant to the President. Photograph by Abbie Rowe, National Park Service, in the John F. Kennedy Presidential Library and Museum, Boston. O’Donnell was in the Secret Service follow car behind President Kennedy when the shots were fired. Robert Kennedy, Jr. said his father didn’t believe the Warren Commission, but like Ken O’Donnell, the former Attorney General went along with the official story of the assassination so as not to stir up any more trouble. Robert Kennedy, Jr. doesn’t believe it either. Even the U.S. Congress disagreed with the Warren Commission’s conclusion that Lee Harvey Oswald acted alone. In their investigation into the killings of Kennedy and Martin Luther King (1976-79) the House Select Committee on Assassinations (HSCA) said President Kennedy was very likely assassinated as the result of a conspiracy. President Kennedy and family, Hyannis Port., August 4, 1962. L-R: John F. Kennedy Jr., Mrs. Kennedy, Caroline Bouvier Kennedy, President Kennedy. Photograph by Cecil Stoughton, White House, in the John F. Kennedy Presidential Library and Museum, Boston. Fifty years later we are no closer to putting this mystery to rest. Everyone who was alive at the time and cognizant of the events of the day still remembers where they were and what they were doing when they first heard the news. And they all have an opinion on what happened that day. Was it a conspiracy? Most likely. Was John Fitzgerald Kennedy a great president? He made the pledge that got us to the moon (May 25, 1961) and created the Peace Corps (March 1, 1961) and avoided nuclear destruction during the Cuban Missile Crisis. His assassination has insured John F. Kennedy a special place in the hearts of many Americans of all stripes and political persuasions. The circumstances of his death will insure he remains at the center of the greatest conspiracy theory of all time. That may be his most well known legacy. I will always remember him as our family’s favorite president. I wanted to clarify that, although Robert Kennedy died on June 6, 1968, he was shot on early Wednesday morning, June 5. I have the newspapers (Rochester Times-Union) for both June 5 and June 6 of 1968. The reason the date is so significant to me is that June 5, 1968 was my 21st Birthday. I was in college and a Kennedy campaigner.supporter, and had met Robert Kennedy when he served as a senator from New York. My mother woke me early on the morning of June 5 to tell me RFK had been shot, She showed me the newspaper headline. I had been looking forward to me 21st birthday for months – meant I could vote! It turned out to be the saddest and most devastating birthday of my life.